1 Departamento de Farmacia, Facultad de Química, Pontificia Universidad Católica de Chile, Santiago, Chile. 2 Instituto de Nutrición y Tecnología de los Alimentos, Universidad de Chile, Santiago, Chile. 3 Facultad de Química y Biología, Universidad de Santiago de Chile, Casilla 40- correo-33, Santiago, Chile. The antioxidant effect of 5-Aminosalicylic acid (5-ASA) on copper-mediated LDL oxidation was followed either by the emitted chemiluminiscence (CL) or by UV-vis spectroscopy. 5-ASA addition extends the lag phase in a concentration-dependent manner without changes in the rate of the process in the autoaccelerated phase. The antioxidant behavior of 5-ASA was very similar to that of Trolox, a very efficient water soluble antioxidant. The copper-binding capacity of 5-ASA was evaluated by UV-visible spectroscopy. The addition of copper to a 5-ASA solution increases the absorbance at 332 nm and generates a new band at 298 nm. These changes in the UV-vis spectra indicate formation of a complex between 5-ASA and copper. However, LDL protection by 5-ASA is unrelated to its copper chelating capacity. Key terms: 5-Aminosalicylic acid, Antioxidant, LDL oxidation. 5-Aminosalicylic acid (5-ASA) is an antiinflammatory drug widely used in the therapy of bowel diseases, such as Crohn's disease and ulcerative colitis (Hanauer & Present, 2003). 5-ASA has shown to be an efficient scavenger of oxygen free radicals, reactive species that play a significant role in the pathogenesis of inflammatory disorders of the gastrointestinal tract (Conner et al., 1996). The antioxidant effect of 5-ASA has been evaluated mainly in lipid peroxidation of membranes (Goncalves et al., 1998a; Dinis et al., 1994; Kanski et al., 2001; Pearson et al., 1996). Depending on the free radical source employed, 5- ASA has been proposed to be either less (Goncalves et al., 1998a) or more reactive (Pearson et al., 1996) than ascorbic acid towards peroxyl radicals. The oxidation of human low-density lipoprotein (LDL) is an early event in atherogenesis (Ross, 1993). The lipoprotein oxidation can, at least in vitro, be inhibited or delayed by antioxidants, such as phenols or polyphenols (Brown et al., 1998). However, the antioxidant effect of 5-ASA on the LDL oxidation has not been evaluated. Therefore, we present data bearing on the efficiency and mechanism of 5-ASA protection of LDL oxidation. 5-ASA and Trolox (Fig. 1) were purchased from Sigma-Aldrich (St. Louis, MO). Copper sulfate was purchased from Merck. All chemicals were employed as received. Human LDL (1.019-1.063 g/mL) were prepared by zonal centrifugation from plasma obtained from normolipemidic blood donors. Prior to oxidation, EDTA in the LDL solution was removed with two passages through an Econo-Pac 10G desalting column (Bio-Rad, Richmond, CA) hydrated and eluted with phosphate buffered saline (PBS). Protein concentrations in LDL preparations were determined by a modification of the Lowry method using bovine serum albumin as a reference standard (Hotzer et al., 2005). After elimination of EDTA, LDL samples were kept at 4 °C and used less than five days after purification. Some samples ("old" LDL samples) were employed two months after EDTA removal. The extent of LDL oxidation induced by copper addition was followed by the increase in absorbance at 234 nm, due to the formation of conjugated diene hydroperoxides, and by the emitted low-level chemiluminescence (CL). 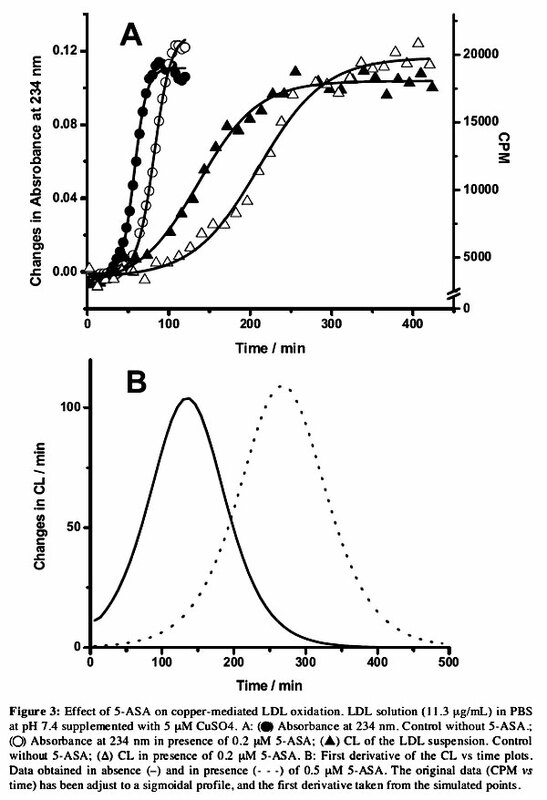 The reaction mixture containing LDL (11.3 µg/mL) plus copper sulfate (5 µM) with or without 5-ASA or Trolox (0.1 - 1 µM), was incubated in PBS buffer (pH 7.4) at 37°C in the thermostatized cuvette of a Shimadzu 2401 UV-visible spectrophotometer. Low-level chemiluminescence was measured in samples incubated at room temperature (22 °C) in a Beckman LS-6500 liquid scintillation counter operating in the "out of coincidence" mode. Complex formation between 5-ASA and copper was studied by UV-visible spectroscopy. The experiments were carried out in water containing 50 µM of 5- ASA and 10-600 µM copper sulfate. UV-vis spectra were registered in a Hewlett Packard 8453 (Palo Alto, CA, USA) spectrophotometer at room temperature. 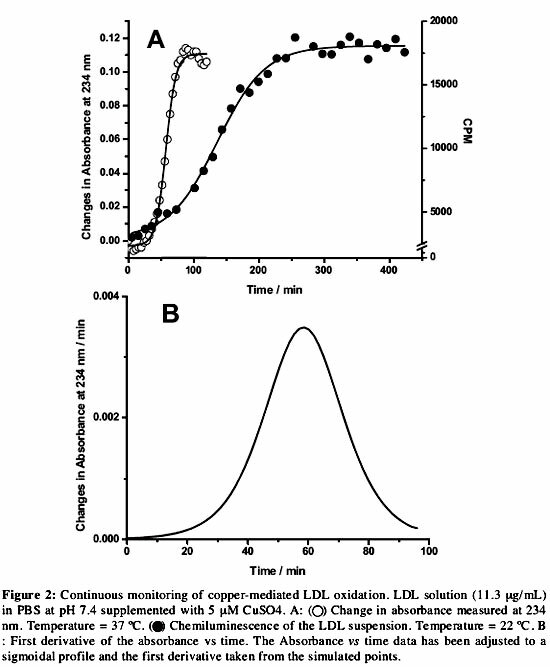 Copper mediated LDL oxidation was followed either by UV-vis spectroscopy or by the emitted chemiluminiscence (CL) assay. For both techniques a typical sigmoidal profile of an autocatalytic process was observed (Fig. 2A). The differences observed in the lag-phase (t lag) (longer in the CL measurements) are due to the lower temperature of these experiments. Furthermore, it must be considered that, while the absorbance is directly related to product formation (conjugated dienes), the CL is a rate whose intensity is determined by the concentration of the emitting species (Lissietal., 1988). There are several parameters, additional to the t lag, which can be obtained from diene concentration vs time profiles. For example, it is possible to evaluate the time required to reach half maximum diene concentration (t 1/2), and the maximum velocity (v) of the lipid peroxidation, given by the peak of the first derivative (Fig. 2B) (Gieseg & Esterbauer, 1994). Furthermore, the maximum diene concentration (diene max) can be estimated from the maximum increase of the absorbance at 234 nm. The conversion of absorbance into diene concentration is based on a molar absorptivity (e) of 29.500 M-1 cm-1 at 234 nm (Gieseg & Esterbauer, 1994). In our experimental conditions, in a typical experiment in absence of additives, a t lag = 44 min, t 1/2 - 59 min, v = 0.13 µM min, and [diene max] = 3.4 µM was found. These values were somehow dependent on the LDL sample considered. 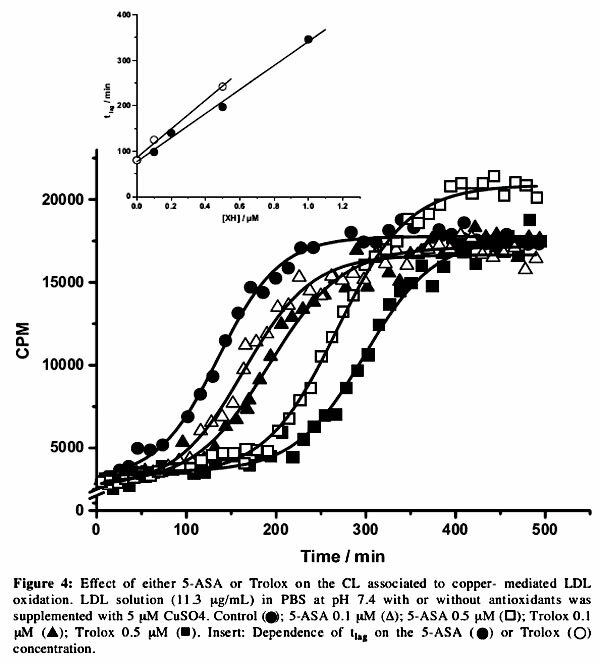 The effect of 5-ASA was examined on copper-mediated LDL oxidation. As shown in Fig. 3, either by CL or by UV-visible spectroscopy, 5-ASA extended the lag time of the oxidation process. The protection afforded by 5-ASA addition is only slightly smaller than that elicited by Trolox (Fig. 4), a very efficient water soluble antioxidant (t lag 5-ASA = 197 and t lag Trolox = 242 min at 0.5 µM by CL). Either for 5-ASA or Trolox the t lag increased in a concentration-dependent manner (insert Fig. 4), delaying the start of the propagation phase even at the lowest assayed concentration (t lag = 98 min at 5-ASA 0.1 µM by CL). However, no changes in the rate of the process taking place after the lag phase are observed (Fig. 3B). The delay of LDL oxidation elicited by submicromolar 5-ASA concentrations could be of physiological significance since a simple dose of 5-ASA administered to patients with ulcerative proctitis leads to micromolar plasma concentrations of the drug (Aumais et al., 2003). Furthermore, the levels of 5-ASA concentrations have the same order of magnitude than plasma vitamin E and they are considerably higher than polyphenol concentrations, following the intake of antioxidant-rich beverages, such as tea or wine (Behrens et al., 1982; Widlanskyetal.,2005). The antioxidant effect of 5-ASA was evaluated in "old" LDL samples. These samples are devoid of endogenous antioxidants, as evidenced by the lack of an induction time (Fig. 5). No protection of LDL oxidation was observed when 5-ASA 0.5 µM was added to the samples (Fig. 5). This lack of effect would indicate that the protection by 5-ASA requires the presence of the endogenous antioxidants (cc-tocopherol). A plausible mechanism of action could be a recycling of the cc-tocopherol derived radicals by 5-ASA (Goncalves et al., 1998b). This proposal is compatible with the similarities of the reaction profiles shown in Fig. 3. Copper chelating capacity of 5-ASA. Since the LDL oxidation employs copper as catalyst, we evaluated the capacity of 5-ASA to chelate this ion. For this purpose, we determined the effect of copper (10-600 µM) upon the UV-visible spectrum of 5-ASA (50 µM). The addition of copper produced both an increase of absorbance at 332 nm and a new band at 298 nm (Fig. 6). These changes indicate formation of a complex between 5-ASA and copper. Control solutions, containing either 5-ASA (50 µM) or copper sulfate (1 mM) were run in the same conditions without significant absorbances at the considered wavelengths. This proposal is compatible with the reported capacity of 5-ASA to chelate other 2+ cations (Grisham et al., 1992). In the present system, a value of the association constant could not be obtained since there was not a linear correlation between the absorbance at 298 nm with [Cu(II)]free x [5-ASA]free, suggesting that complex formation does not respond to a simple 1:1 stoichiometry. The formation of a 5-ASA-copper(II) complex must then be considered in the interpretation of the present data. However, we consider that complex formation can not per se explain the protection of LDL oxidation afforded by 5-ASA. In fact, in the protection experiments the 5-ASA concentration is considerably smaller than that of the catalyst. Then, even if the complex is quantitatively formed, the free Cu concentration would be only slightly decreased. On the other hand, complex formation could protect the LDL if it competes with Cu(II) adsorption on the LDL, a pre-requisite for the initiation of the chain oxidation process. However, this competition would lead to a decrease in the rate of the process after the lag time. This effect is not observed (Fig. 3) suggesting that 5-ASA protection is not due to a reduction in the rate of the initiation process. This is further supported by the lack of effect observed employing "old" LDL samples (Fig. 5). 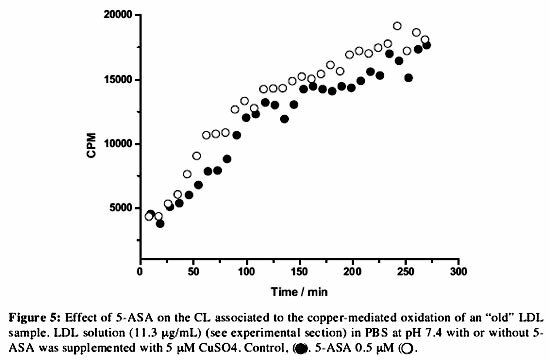 5-ASA micromolar concentrations retard copper-mediated LDL oxidation. 5- ASA efficiency is only slightly smaller than that of Trolox. 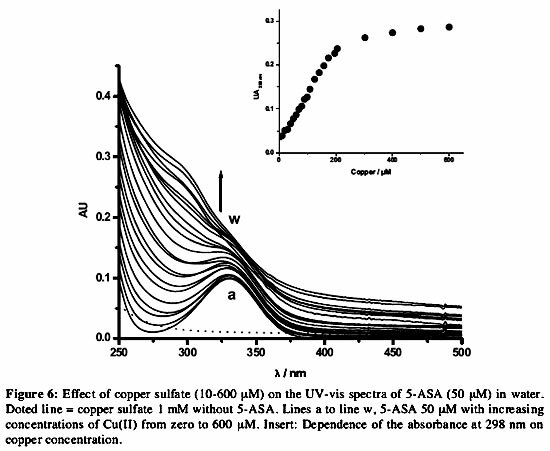 From changes in the UV- vis spectrum of 5-ASA induced by copper sulfate it can be concluded that 5-ASA is able to complex Cu(II) ions. However, this process would be unrelated to the 5- ASA inhibitory effect. The protection afforded could be due to a chain breaking effect of 5-ASA or, more probably, to a reduced rate of consumption of the LDL endogenous antioxidants. This work was supported by FONDECYT (Projects 3040002 and 1030033).